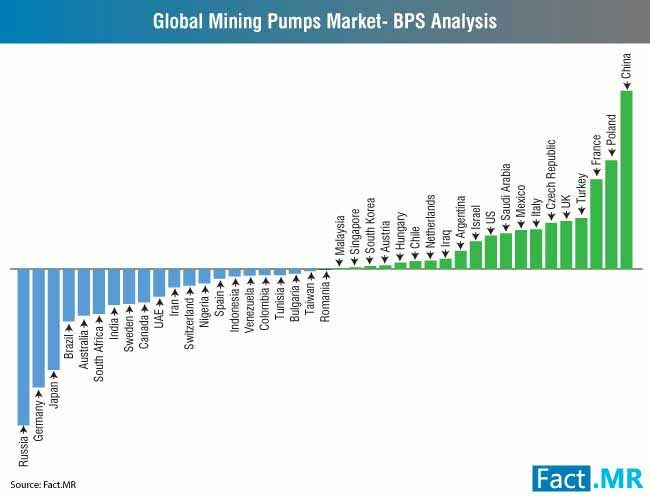 The mining pumps market remains moderately-consolidated, with tier 1 and tier 2 players accounting for a collective 60-70% revenue share. The top 6 players, namely Xylem, Flowserve Corporation, KSB SE & Co. KGaA, Weir Group, Sulzer Ltd., and GRUNDFOS, account for around 40-48% share, driven by their superior product portfolios. Rapid permeation across prominent customer segments with operational excellence remains one of the key focus areas of the leading players in the mining pumps market. Moreover, growing sales of mining pumps through persistent innovations and developments also remains a key revenue lever of these companies. 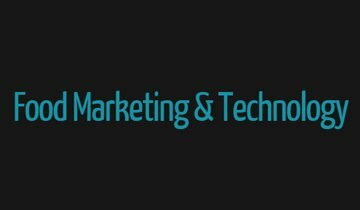 Furthermore, amelioration of product efficiency, in tune with application-specific protocols, are one of the focal points of these companies for long-term customer retention. 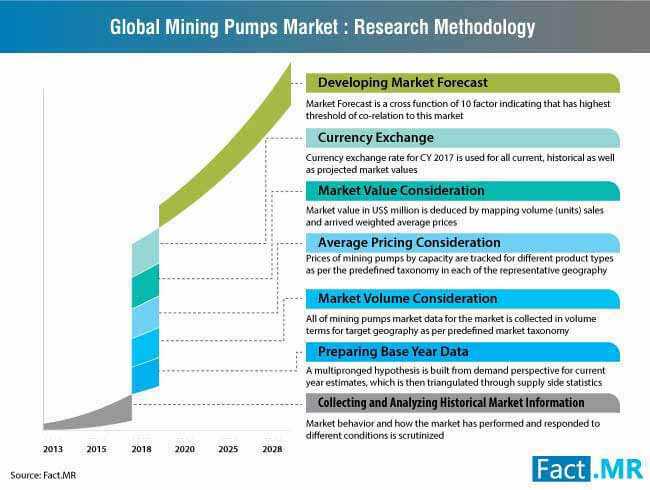 Mining pumps manufacturers remain oriented toward various ways of obtaining significant benefits, owing to the volatile nature of global pump market. The growing eminence of ‘Industry 4.0’ and ‘Industrial Internet of Things (IIoT)’ in industrial automation is encouraging manufacturers of mining pumps to craft new products in line with the same. This is foreseen to introduce a pool of new opportunities for the key stakeholders and drive the emergence of new business models in line with evolving realities. The key objective behind such product diversifications is the enhancement of user experience via fully integrated solutions. Convergence of intelligence with pump infrastructure enables every component to have its own set of protocols and empowers its competency to effectively communicate with its fellow components, scaling up the overall efficiency factor. 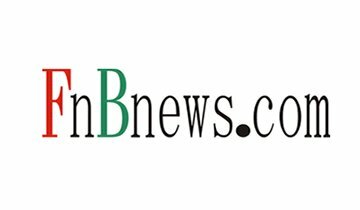 Key manufacturers are eyeing technologies as such to drive notable profits and solidify their market sustenance. Leading players have made notable efforts to highlight prominence of these technologies for boosting performance of the next-generation mining pumps. Investments in new mining projects and amelioration of existing projects across various regions have revved up by a significant margin. For instance, the ‘New Federal Mining Agreement’ was drafted in the year 2017 and was aimed at attracting investments in the regional mining sector. As per United States Census Bureau, mining was one of the sectors with the largest absolute increase in terms of capital investments from 2006 to 2015 i.e. 75.9 percent. Burgeoning investments in mining projects are pushing the demand for new equipment and machinery. Mining pumps, as one of the integral parts of the overall mining infrastructure, are also being highly sought-after for use in productive or extractive processes. The expenses on pumps broadly fall under either of the two investment categories, greenfield investments (for instance setting up of a new mine) or brownfield investments (refurbishing an existing facility). Apart from the conventional commodities, new investments are gaining prominence with regard to extraction of ‘new-age minerals’, such as cobalt, copper, nickel, lithium, and many more. For instance, the growing demand for Li-ion batteries is pushing the demand for Lithium. Likewise, cobalt is also garnering significant attention on the back of its necessity in case of electric vehicles. Prominent miners across the globe are eyeing these commodities in a bid to attain substantial benefits, owing to their long-term prospects and their rising prominence apropos of the technology of the future. Leading mining firms, with an objective of tapping into new opportunities, are vying to capitalize on this evolving trend having an optimistic potential. Cost-effectiveness and easy installation are two of the key attributes enhancing the appeal of centrifugal mining pumps. Easy installation, coupled with superior performance attributes, are the key factors scaling up the popularity of centrifugal mining pumps. However, high maintenance and controlling issues in case of low flow rates are few of the prominent factors that might pose challenges apropos of adoption. Minimal cost-effectiveness, as compared to other mining pump types, is another key factor that might also confine the adoption of centrifugal mining pumps. For more compelling insights on mining pumps market, get in touch with our expert analysts. Flowserve Corporation entered into a global partnership with Azima Inc. in the year 2017. This partnership delivers an exclusive predictive maintenance solution for industrial pumps as well as other rotating equipment. Xylem Inc., a key player in the mining pumps market, acquired PIMS Group of the U.K in the year 2013. 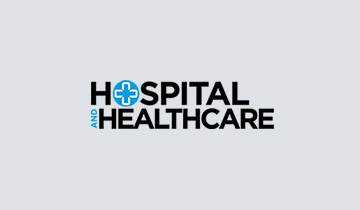 This acquisition is aimed at adding an industry-leading service capability built on PIMS’ talent, tools and processes. For a detailed coverage of the competitive landscape of mining pumps market, get in touch with our expert analysts. Mining pumps are the pumps involved as a crucial part of the mining process. Mining pumps are employed for a wide range of activities, such as abrasive sludge dewatering, mineral processing, slurry transfer, and waste water and tailing transfer. The report on mining pumps market compiles an unbiased and unmatched analysis of the growth roadmap of mining pumps market over the forecast timeline. 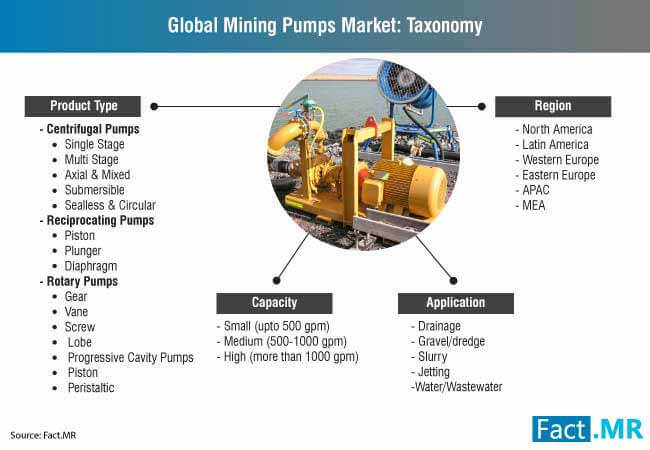 The research study on mining pumps market features an all-inclusive outlook of the global mining pumps landscape along with a detailed segmental analysis for in-depth understanding of mining pumps market. Moreover, influencing factors of the mining pump market, such as demand generators, prevalent trends, and prime opportunities, have also been discussed with their relevant impact on mining pumps market. The market structure section in the mining pumps market report enunciates on the detailed market taxonomy of mining pumps market, on the basis of various segments analyzed. By capacity, the mining pumps market has been segmented into into small (upto 500 gpm), medium (500-1000 gpm), and high (more than 1000 gpm). By application, the mining pumps market has been segmented into drainage, gravel/dredge, slurry, jetting, and water/wastewater. By product type, the mining pumps market has been segmented into centrifugal pumps, reciprocating pumps, and rotary pumps. By region, the growth of mining pumps market has been analyzed across key regions such as North America, Latin America, Western Europe, Eastern Europe, APAC, and MEA. In addition to the aforementioned insights for the mining pumps market, the research study on mining pumps market takes care of other crucial aspects and facets of mining pumps market having a major role in the growth of mining pumps market. Moreover, an end-to-end coverage of mining pumps market as such can help the aspiring players in the mining pumps market vying to make it big in the mining pumps market and gain competitive advantages. 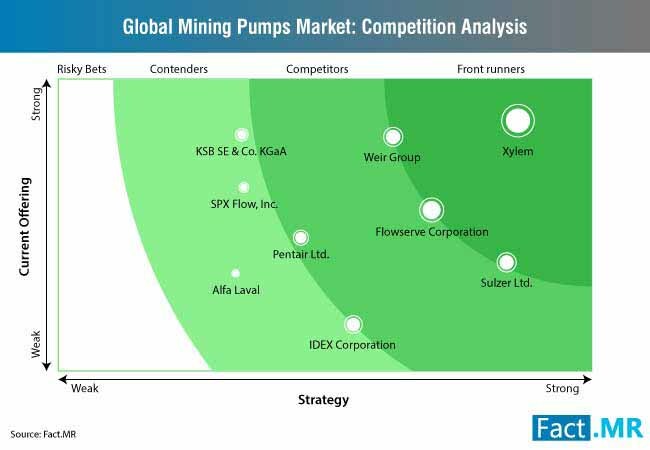 What strategies can help the emerging players of the mining pumps market enhance their bottom line? 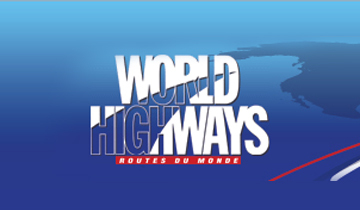 Which region will proliferate in terms of highest volume sales in the mining pumps market? Which mining pumps product type will have the highest market value by 2018-end? What are the major challenges the key players in the mining pumps market highly likely to face? This section in the mining pumps market highlights convincing insights of mining pumps market apropos of the growth course of mining pumps market over the forecast period. A constructive research methodology for mining pumps market forms the foundation of ground-breaking insights included in mining pumps market report. The research methodology leveraged for garnering insights for the mining pumps market consists of information on mining pumps market, procured from both primary as well as secondary research. Moreover, the insights for mining pumps market in the secondary research are further reexamined and confirmed by the experts of the mining pumps market contacted in the primary research phase. 14.6. EBARA Pumps Europe S.p.A.